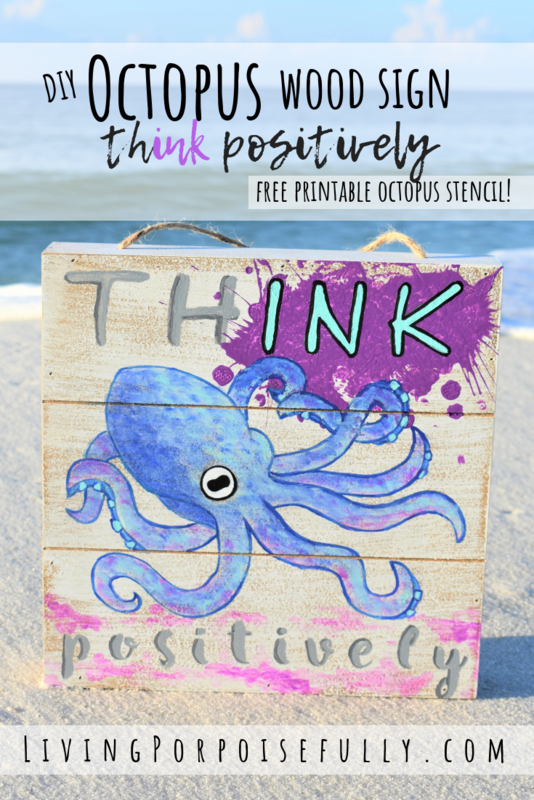 Today, we’re sharing an over-the-top octopus DIY art adventure, complete with our very own free printable octopus stencil! Just in time for World Octopus Day (October 8th, woot woot! ), this is a celebration-worthy adventure that involves splattering paint (SO fun) and feel-good ocean vibes to “thINK positively”! Oh, and the printable can also be used as a coloring sheet for kids, and we’ve made it brainy too with all sorts of awesome fun facts and cool words. We have a dear friend to thank for the inspiration behind this adventure: her office is filled with fun and eclectic art that celebrates cephalopods, the amazing group of animals that includes the octopus, squid, cuttlefish, and nautilus. We’ve definitely got a “thing” for these animals too — they appear in all of our books: squid in Mira, the Misfit Sea Dragon; an octopus in Zale’s Tales: The Ocean Seeker, a vampire squid (of course) is in Shalloween: An Undersea Halloween Adventure; and both a giant squid and octopus show up in Zale’s Tales: The Quest for the Magic Pearl. …And then we embarked on a creative journey to try and include all of these. See how we did it below and make your own tweaks, use the colors that you love and have fun! 6. Then comes the octopus painting, and capturing the awesome cephalopod skin! First, outline it, and then use a stippling motion with the paint brush (video below) with different colors of watered-down paint layer by layer. We did watered-down cobalt blue, then aqua, then purple. Let it all dry, and that’s it! 8 arms with suction cups? Yep. Count ’em up! Wit and brainy charm? Oh yeah.